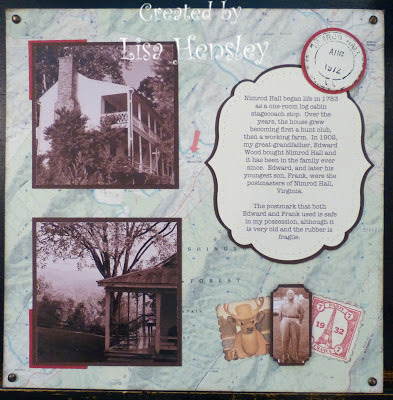 Today I'm showing you another of my 8" x 8" scrapbook pages, featuring a brief history of Nimrod Hall, my family's place. I created my background by printing out a map from the National Geological Survey, which is in the public domain, highlighting the location of the farm. What a wonderful story, and a great page to share. Cool idea on teh background too, you have a rich family history! What an interesting history! And the map as a background for your page is so cool! Brilliant! Lisa, this is such an interesting historical scrapbook page. I loved reading the story and seeing a map used as the background layer. Love it! So very nice - especially love the photo in the label. Gorgeous page! I love the elements you used to make it look aged!